We are currently accepting applications for part-time (seasonal and non-seasonal) position openings. Please read through the position descriptions and if you meet these criteria, we encourage you to apply! We offer a competitive hourly wage, employee discounts, flexible scheduling and a creative work environment! The position we are hiring for requires candidates to have the utmost positive, “can do” attitude at all times, have excellent communication and super friendly people skills, be able to work in a team environment, sometimes work by themselves, and be punctual and responsible. Qualified applicants are encouraged to stop in to the studio to pick up an application to complete (no phone calls or emails please) as follow-ups and interviews will be taking place shortly. Must be available to work Fridays, Saturdays, Sundays. Weekdays & weeknights a plus! Qualified applicants must be able to work at a quick pace, consistently be able to stand and walk for long periods of time, climb ladders, and occasionally lift items up to 25 lbs or more. Qualified applicants must be 18 or older with their own reliable transportation as they will be opening/closing the studio, sometimes as late as 11pm as well as operating studio machinery related to the ceramic process. Seasonal employees must be 16 or older with reliable transportation and be available to work during all school breaks. Awesome customer service skills and the desire to help and instruct customers with their creations. Hours average between 15-25 hours per week and may be more during peak seasons. Basic responsibilities of the position include but are not limited to providing excellent customer service to our guests by servicing, assisting, and teaching customers and groups, actively selling studio products and promoting events, glazing, loading and unloading pottery in a kiln, unpacking and restocking product shipments, cleaning the studio, more cleaning, unpacking shipments, restocking, and performing opening/closing duties. Please note that Studio Associates do not sit and paint pottery as part of their job duties, this is a very active position working on your feet most of the day, very similar to a restaurant/waitstaff position. You bring the great attitude, we provide full training and a fun and rewarding working environment! Pottery Piazza is looking to hire a Wheel Throwing Instructor (non-seasonal, permanent) for our busy Paint Your Own Pottery Studio as our offerings include wheel throwing classes to our customers. Wheel Throwing Instructors must be skilled potters with a minimum of 1 to 3 years experience in wheel throwing and be knowledgeable in high and low fire glazing techniques, as well as basic hand building skills. Must be able to demonstrate a strong throwing ability on a motorized potter’s wheel. Candidates will have prior experience in either teaching or the assisting of teaching ceramics and/or wheel throwing and are expected to be able to provide quality, guided instruction to both children and adults with varying levels of skill at wheel throwing. Ideal candidates will have at least one to two years of pottery or wheel class management experience but it is not required. Must be available for daytime and evening shifts as well as weekends. Hours may vary weekly based on class/event signups and scheduling is somewhat flexible but based on business need. Must be able to lead private/individual lessons, couples wheel throwing classes, small group classes, kid’s camps (during summer), and weekly courses in skill/technique building, as well as provide instruction and supervision for the proper and safe use of tools, materials, and equipment. Able to guide participants through their class experience and encourage and promote fun as well as success. 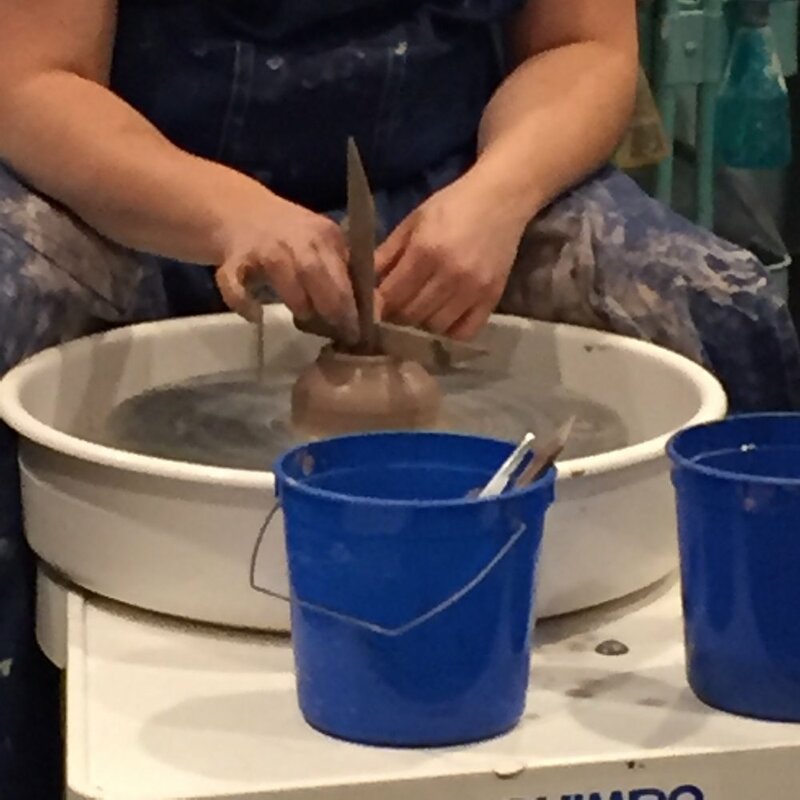 Instructors are expected to maintain the cleanliness and organization of the wheel throwing studio, prepare materials and supplies in advance of classes/events so our customers’ expectations are met and they receive a consistent professional experience. Awesome customer service skills and the desire to help and instruct customers with their creations is of the utmost importance. Instructors will also perform some of the background work for the pottery studio including loading and firing kilns, preparing clay and glazes, equipment and general studio maintenance, as well as assist management in the creation of new classes and offerings to keep things interesting for our customers. These responsibilities include making sure customer pieces are fired and finished for pick up on time, answering the phone/answering general questions about the studio as well as our wheel throwing offerings, processing customer payment transactions, booking individual/group lessons and cleaning the studio. The position we are hiring for requires candidates to have the utmost positive, “can do” attitude at all times, have excellent communication and super friendly people skills, be able to work in a team environment with other staff, be punctual and responsible. Qualified applicants are encouraged to stop in to the studio to pick up an application to complete and apply right away as follow-ups and interviews will be taking place shortly. 1-3 years minimum pottery wheel throwing experience with strong individual throwing ability. High School Diploma plus College ceramics experience or formal related training in pottery (degree a plus). The Pottery Piazza is an equal opportunity employer.